This month, I'll be interviewing Christine Hunt, whose writing includes fiction, non-fiction, and stage plays. Christine formed Right Line Editing & Design in 2005, assisting clients with a wide variety of projects —from business cards to editing manuscripts and book production. In 2010, she started Right Line Publishing to produce You Are What You See by Scott Nehring. (You may remember I reviewed this book and interviewed its author in my November and December installments last year.) Christine is a member of the Editorial Freelancer’s Association (EFA) and other industry groups. JR: Welcome to Hoosier Ink, Christine. Let me start with the typical starting question for authors: How did you start writing? CH: Thank you for inviting me, Jeff. You’ve collected some interesting, informative reading on Hoosier Ink. I like Millie Samuelson’s suggestion of AYC for “at your convenience.” Everything doesn’t have to be done immediately; so many well-done things take time. Reading and writing were always my escape. During high school a friend and I wrote a play based on the Biblical book of Acts. Our church’s youth choir loved it—performed it during a summer choir tour through several southwestern states, and I was hooked. I stayed active in church and since I wanted more than the normal fare of bathrobe dramas during the holidays, and being a Type A personality, I volunteered to write and direct. Productions became more professional in quality. I was hired as scriptwriter for an audio/visual production company, and it’s progressed from there—ghostwriting and clean-up work for businesses, individuals, and non-profits. JR: You've told me your writing is primarily stage plays, though you do have both a narrative non-fiction work and a novel in the pipeline in addition to business writing. How does writing a stage play differ from other writing, and does it help you in your other writing? CH: That’s a thoughtful question, Jeff. We are created to emotionally respond to story—the journey of a heroic character through extreme difficulty. Even small segments of that journey resonate with us; that’s why advertising works. We see a guy who’s had a rough day, he climbs into his quiet car, turns on the A/C and the radio, relaxes back into cushy leather, and drives fast out of the city with a smile on his face. Even if we’re not in the market for a new car, we identify with the guy and this snippet of his story. Watching audience reactions to moments in my stage plays provided instant and unguarded feedback. I saw what worked, what didn’t, what could have. I learned the need for economy in words, actions, even characters. I think one of the most valuable things I learned, however, was the importance of communicating an understandable, retainable, orderly progression of information—revealing point upon point. In that particular, all writing can be considered similar. Whether it’s a small business’s annual report or personal e-mail to a friend, if your writing isn’t understandable, doesn’t connect with the story of life or communicate your intent, then it’s a waste of everyone’s time and effort. JR: Your stage plays and some of your shorter works are adaptations of Bible stories. How do you balance between having a fresh story -- especially with the much adapted Christmas and Easter narratives -- while being accurate to the Biblical text? This may either be a clarifying question or a related one, but how do you keep from putting a spin or agenda to the story while retelling it? CH: If you don’t mind, I’d like to break the question into sections. You ask about keeping a familiar story fresh. My instant reaction is that Scripture is alive, powerful—it’s a treasure trove we can’t find the bottom of. As we grow in Christ, as we experience hard times or become aware of new truths, as we see more and more of His grace and how He is active in our lives and in the world—as we live life in Him—our perspective changes, we have deeper understanding. That’s one way it stays fresh. Another thing that keeps story perspectives fresh is keying on different individuals, learning more of what life was really like for them in their time, in their place. One resource I recently found are the works of Dr. Kenneth E. Bailey, specifically Jesus and the Prodigal and Jesus Through Middle Eastern Eyes. Your saying, “while being accurate to the Biblical text” is probably the most important piece of the whole puzzle, whether or not I’m writing something with any overt spiritual content. To me, if what I do or say doesn’t line up with the truth of Scripture, then I’m in error, whether it’s my personal life or my writing. Part of digging for the treasure in His word is searching for understanding—deeper truths—studying the nuances of words and their meanings within their accurate context. Everything we say or do—or write—comes from our individual set of experiences, awarenesses, our scars and sorrows and joys, and lessons learned; so, from that standpoint, there’s always going to be pieces of an author in everything they write. As far as a spin or agenda—that’s an excellent question because today’s movers-n-shakers, our culture makers, are always spinning things to their advantage. Even when we mean well, we, as humans, are bent toward putting the best face on things. That’s where, for me, writing from the word of God is so very different than any other writing. It’s not my story, it’s His. He’s just letting me use a little sanctified imagination to nuance out of it, if you’ll allow me to use that term, to delve into it and extract truths to communicate. But I have to remember, always, it’s His story not mine. I’ll get a check, a hesitation, an impression—whatever you want to call it—that I’m going the wrong way or pursuing a tangent, and I have to stop, back up to where it’s safe, and then pray for wisdom and guidance to do it right. It’s always done in prayer. And I have a core group of people who intercede for me. JR: I mentioned your narrative non-fiction work that's nearing publication and the novel you're working on. Could you tell us about them? In May 1973, a florist named Bob Nachtsheim was murdered. The media named it The Orchid Murder, but the crime was never solved. Years later, Norm Wartnick, Nachtsheim’s former employer, was sued by the victim’s widow. Norm’s attorney was incompetent—made egregious errors in Norm’s defense and, in 1986, Norm heard a jury declare him responsible for the wrongful death of Nachtsheim. A three-million-dollar civil judgment forced Norm to sell his family business and branded him a murderer. Jerry Snider and Joe Friedberg, two of Minnesota’s top trial attorneys—knowing they would battle enormous pressure from the legal community—put their profitable careers on the line in a six-year long, contingency-fee struggle to get Norm out from under that judgment. In 2007, Norm decided he wanted his story told by someone he could talk with eye-to-eye. It didn’t take much investigation to realize Norm’s was truly an inspirational story—a fight for justice for an innocent man. I quickly understood Joe and Jerry’s passion in wanting justice for Norm. I found the heart of the story, though, when I realized the significance of how the two families handled the situation: the Nachtsheims were splintered apart by greed; the Wartnicks were strengthened through adversity. Throughout the Wartnick’s 21 year struggle, their belief in each other and in the truth preserved them. The Wartnick’s faithfulness to each other touched me deeply. The fiction project is a spin-off. Connections were alleged to exist between the murder and organized crime—plus a slew of fascinating tidbits I couldn’t include in the non-fiction narrative due to story structure constraints. So, I’m using those juicy pieces as back story for a detective/crime novel. My main characters and their story, though, will be totally fictitious. JR: What future projects do you have on the table? Or, in other words, what burden or vision do you want to deal with in your writing? CH: Wow, let’s see. On the front burner is a one-act play based on the Orchid Murder that I hope will be used for high school and college one-act competitions. On the back burner, and unrelated to Wartnick, are four projects: a screenplay based loosely on Jesus’ parable of the prodigal; a series of detective fiction short stories; a fictional trilogy about a female photojournalist’s fight against human trafficking; and a non-fiction project on the “I Am” statements of Christ. Though they seem unrelated—and why it’s interesting that you ask about “burden or vision”—at the core of each story is our desperate need for significance, for value, for purpose. We try so hard to earn them, but they really are unattainable until we find them in the One who designed and intimately crafted each one of us. CH: Thank you, Jeff, for the opportunity to share. More science than art. That's the best way to describe the last category of uncopyrightable material. Or I can give you a list the way the U.S. Copyright Office does and simply say that you can't copyright procedures, methods, systems, processes, discoveries, or devices. This grouping does cover some materials that wouldn't earn the label "science." Procedures and methods include such things as sweepstakes rules and instructions for preparing recipes. There are only so many ways to tell someone to write his or her name and address on a sheet of paper and mail it in. Or to instruct a cook to mix ingredients together and bake them in a 350 degree oven. If that information could be copyrighted, sweepstakes sponsors and Internet recipe sites would all be at risk. But "more science than art" is still the best umbrella phrase for this category. Copyright is for the creative arts, not for scientific mechanisms. Scientific items like inventions are protected under patent law, instead. But descriptions, explanations, and illustrations of those devices can be copyrighted if the text or drawing contains sufficient creativity. Then there are the "useful arts," which combine art and science--or at least art and function. Useful articles cannot be copyrighted but the design elements in them can be if--and only if--they are physically or functionally separate from the device itself. This will rarely if ever apply to writers as writers, but it's a fun exercise anyway. 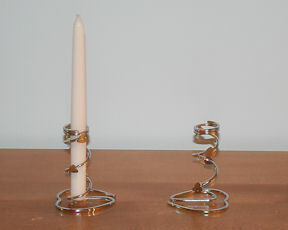 Look at the picture above, which shows the candle holders my daughter bought for her wedding reception. A pretty design, with a heart at the base and a circular staircase wending its way to the top. Art, but not copyrightable. That's because the bottom heart acts as the stand and the spiral keeps the candle from falling over. The design is an integral part of the function. But all is not lost. There are other ways to merge art with function without losing your copyright in the art. You can't keep people from painting pictures on ceramic vases, but you can keep them from painting the same picture you created. Because that's more art than science. Two years ago, I had bilateral knee-replacement surgery. The left knee is nearly perfect. It works fine. The right? That's another story. It's nearly as bad as it was before surgery. I got 50% of what I expected. Back when temps were over the century mark, my air-conditioning went out. Zilch. Nada. The fan wasn't even blowing warm air. I called the office of the apartment complex where I live, and within a half hour, maintenance had yanked the old unit and wrestled a different one into place. (Notice I didn't say a "new" one.) The fan worked on that one, but it didn't cool. I got 50% of what I expected. After another call to the office, I actually got a new one that cools. Huzzah! 100% at last! Years ago, I worked in advertising for Sears, Roebuck, and Co. (Yes, it went by its full name before they truncated it, hacking off more than 50%.) I loved my work. I laid out ads, designed and built floor and window displays, and wrote ad copy. When floor managers would go to lunch, guess who got to cover for them. Yep. Me! I loved that, too, because if it was a slow day, I hauled out the hefty books from which the department managers ordered their stock, and I studied, so I knew why this sofa's construction was better than that lower priced one, how muslin differed from percale, how to determine which tire tread would best suite a customer's needs, and how to tie a four-in-hand knot. I also loved those times when business was bustling. The problem-solving element of sales I found exhilarating. Our writers' craft requires 100%. We can't get by with a 50% approach to research, for example. I'm not sure how writers of yore avoided anachronisms, since I'm constantly chasing down internet rabbit trails to verify some fact such as when certain words entered the common lexicon. My work in progress is set in 1935, so Tillie, my ten-year-old protagonist, can't use a bobby pin to hold her hair back, nor can she say to her best friend, "Hey, toots, wha'cha reading?" Neither term was recorded as in use prior to 1936. A pre-Civil War sheriff's deputy wouldn't have had one. What if I had done only 50% of the research necessary to discover the truth? 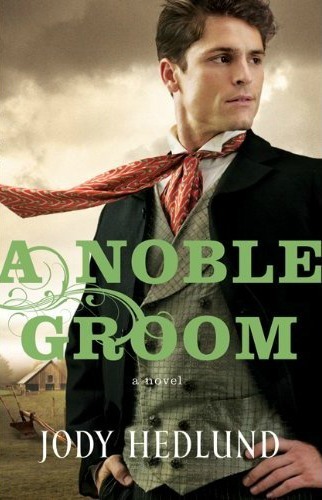 Consider the many genres of fiction--Regency romance, Amish, bonnet, biblical, historical, thriller. The list is endless. Writers who excel in their genre possess an amazing abundance of esoteric knowledge about that genre. Recently I asked an Amish friend if she reads Amish fiction. "Yes," she said, "but only by the writers who get it right." To get it right, Vanessa Chapman, Wanda Brunstetter, Beverly Lewis, Cindy Woodsmall, Beth Wiseman, Amy Clipston, etc., can't settle for less than 100%. Even if they've lived among Plain communities, they constantly check with contacts for accuracy's sake. The same dogged determination that drives us to get the facts right should propel us through the other aspects of our writing, as we thoroughly get to know our characters (I like to interview mine, as I've written about before), our setting (sometimes I draw up house plans or layouts of a town or farm to use as reference), and the plot. The world around us may settle for "50% off," but we dare not. Neither publishers nor readers will tolerate it. It took me a while to get into Elizabeth Camden’s The Rose of Winslow Street, but boy am I glad I pushed through the first few chapters. I was a little put off by not knowing who to trust. Having immigrants from Romania stealing the heroine’s house on the first page was quite an interesting way to start a book. At first I didn’t like Michael Dobrescu... but I’ve come to realize that when an author is able to take me from not even liking a character to absolutely loving him throughout the book—those usually end up being my favorite books! I adored getting to know Liberty Sawyer from page one and was very skeptical whether Michael could deserve her. And oh, don’t worry. He definitely did. I love Elizabeth Camden’s writing style, and I loved this story. Nothing about it was normal. I thought it was interesting that we didn’t see any kissing from Libby’s POV—when those would have been her first kisses in her life at the age of twenty-eight. It was always, “He kissed her...” quickly executed, and simple. I loved Mirela’s thread throughout the story—we did see her POV twice. It often bothers me when an author will write strictly from hero and heroine... and then suddenly there’s someone else too. But I adored her character and was heart-broken for what she’d been through in her young life. She was a fighter, and one more reason I liked this book so much. 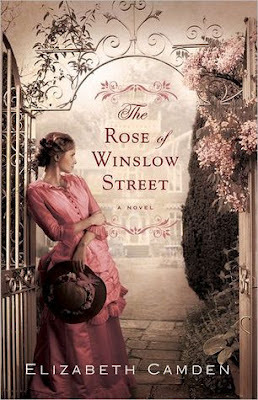 I give The Rose on Winslow Street 5 Stars. For whatever reason, I'm sure many of you reading this are like me and could not make it to the ACFW National conference this year. Finances, your "day" job, or family matters might have prevented you from attending or changed your plans to attend. But, fear not! Next year the conference is back in Indy! Pray that God will open the opportunity or adjust your circumstances so that you will be able to attend. Start saving now. Pinch every penny so that you can take advantage of all the opportunities. Start networking to find a buddy to stay with during the conference. Make a commitment to yourself to have your manuscript ready. Read our Hoosier Ink newsletters, the ACFW Journals (the national magazine), the local and national Yahoo groups, and visit acfw.com to read about the experiences of others. Network with those that did attend so that you can be more informed about what decisions you need to make regarding courses, editors, etc. If possible, purchase the 2012 conference recordings. If you were not there in person, you can still "attend" this way. I was one who was all set to attend this year, but work prevented me from attending; therefore, I decided to focus my efforts on making next year a reality. The ACFW National conference can be one of the most important experiences in your writing life. Having only attended one so far, it made a huge difference in my writing life. Not the US battleship Missouri, but momentum. How do I keep this writing thing moving forward? I thought of this at work while trying to move a line of about 20 refrigerators. They were all sitting in a neat row on their little skids. They looked good and had passed testing and inspection. The next stops were packaging and shipping. But, they had missed their mark. They had stopped several inches short of a sensor that would start a motor to roll the line and send them on their way. I thought of Buck, the sled dog in Call of the Wild. In a pulling contest, his driver called for him to lean to the left, then the right, to break an overloaded sled loose and get it moving. That was all I had to do -- just get those things moving, just a few inches. So I leaned into them with my arms braced and tried to budge them just a little farther. If I had reached them earlier I might have been able to start pushing while they were still rolling, even slightly, just enough to continued making forward motion. Sometimes I feel like my writing is at a stand still and that I have to do something to just get it moving, or keep it moving no matter how slowly. For me that boils down to continuing to write, inspite of work, the farm, 4-H, band, Cub Scouts, Little League and all else going on. For instance, I am trying to work on more than one project at a time -- a novel, a novella, and had some ideas for more devotionals that I hope to sell. Hanging out with other writers inspires me. I just have to keep inching forward. Today I'm pleased to interview award-winning author Jill Williamson, who enjoys creating "weird books for teens." Let's get started! Jill, you've been a reader since childhood. At what stage in life did you realize you wanted to write for publication? Not until I was about twenty-six years old. I had recently left the fashion industry, which had always been my dream. My husband and I were very involved in our church, working with teens. I wanted to do some kind of speaking to teens, to motivate and encourage them. I discovered that sometimes, people hire speakers based on articles written by the speaker. So I looked into writing articles. Then the new Harry Potter book came out, and a new barrage of debates within the church community flared up as to whether or not the books were bad for Christians to read. The debate inspired me to write my own teen novel that all Christians would love. Yes, I was very naive. I have since learned that no one likes every book. But that’s how I got started. I was inspired to try and write blockbuster-style stories for teens that glorified God. You've been published by the large firm Zondervan and by the newer and smaller Marcher Lord Press. Please share some of the differences in working with distinctly different publishers. The editorial timeline is a much slower pace at Zondervan. Everything happens right before the release at Marcher Lord Press. Zondervan has more money to pour into marketing, where Marcher Lord Press has limited resources. Also, and probably the biggest difference, is that Zondervan books are stocked by bookstores. Marcher Lord Press sells primarily online. With Marcher Lord Press, since there are only two employees, I tend to get answers to my questions right away. Zondervan can take longer. You've written fantasy, sci-fi, speculative contemporary fiction... Because author branding is much discussed, how do you view branding as it applies to your own writing? Can you categorize the fruit of your imagination? For me, as long as it’s weird, I can write it. 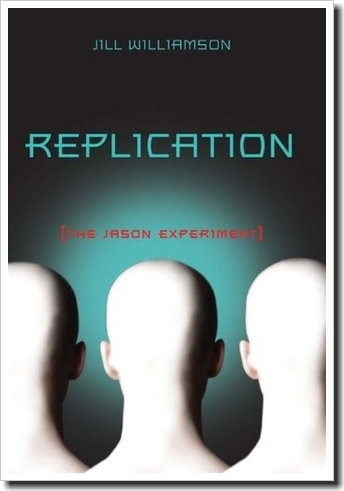 Anything that falls under the umbrella of speculative fiction is fair game. Yes, author branding is important, and I could have tried to become the medieval fantasy lady, and probably been more successful, but that’s not me. I’m far too random of a human being to stay that focused. 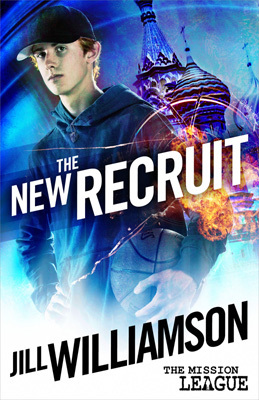 Your latest release, The New Recruit, is unlike anything I've read before. Please share a few words about it, including how the seedling for that idea first took root in your imagination. This was the very first book I ever wrote. I pieced it together in a very backwards way. I was trying to write a story about teens going out into the world like missionaries, but since teen fiction books about missionaries weren't getting the attention of agents and editors, I thought, let's tweak the story and turn them into undercover agents. How far into the future do you plan your stories? Are you planning the next one while writing the current one, or do you take them one story at a time? I always have several ideas in my head. I try to stay loyal to one until it’s finished, but that doesn’t usually work. So, oftentimes I’m writing one story, and then I need to take a break to work on brainstorming a new idea and writing the proposal. Once that’s turned in, I go back to the story I was writing. I’d rather not bounce back and forth, but I think that’s how it has to be when you release multiple books in one year. It's no secret that writers' choices of reading material help to shape their creativity. Name some major literary influences in your past reading. Books I loved as a child: Nancy Drew, Little House, Anne of Green Gables, The Hobbit, the Narnia books. When I grew up, books I loved: John Grisham, Peretti, Francine Rivers, Tolkien. And I wasn’t really inspired by books to become an author. Once I began to write, so many authors inspired me. Here is a list of authors that have impressed me in one way or another: Frank Peretti, Ted Dekker, Megan Whalen Turner, JK Rowling, Rick Riordan, Scott Westerfeld, Robert Liparulo, Melody Carlson, Robin Jones Gunn, Bill Myers. 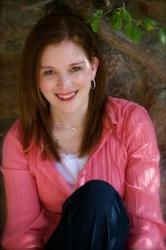 Share a few words about your relationship with your literary agent, Amanda Luedeke of MacGregor Literary. When and how did you get acquainted? Had you communicated with other agents before Amanda? I’d had an agent prior to Amanda. And my previous agent was a good man and a good agent. But he wasn’t the right agent for me. So beforeI met Amanda, I was agentless, and I’d been praying for someone who really loved my writing. I wanted more than an, “I can sell this.” I wanted someone who actually liked my stories. When I saw that Chip MacGregor had added Amanda as an agent and that she was going to be at the Oregon Christian Writer’s conference (her first conference, I think), I felt like God created an agent just for me. I saw Chip and mentioned that I’d signed up to speak with her, and he went out of his way to introduce us. (That was so cool, by the way.) And one of the first things Amanda said to me was, “I really like your writing.” I was so happy. I didn’t care that she was brand new to agenting. She was the answer to my prayer. And she and I get along really well. I’m very blessed to have her on my team. So far, you've been targeting young-adult audiences. Are these the readers you want to stick with, or do you have plans to write for adults too? I have no desire to write for adults. I suppose I could. And my Blood of Kings trilogy was considered adult by my publisher, even though I consider it YA. But I feel called to write for teens. I’m always open to change, but I don’t see that happening in the near future. You're a wife and mom, which undoubtedly demands much time. How do you manage to carve out hours (or minutes) for creative writing? My kids are in school now, so I have all day, Monday through Thursday (only four days of school where I live) to write. Summers are harder. My husband is very supportive and does a lot with our kids to give me the time I need. From your own experience, give one piece of advice for writers who have been studying and polishing their writing craft but who want to improve and grow in their skill. Just write more. The more books you write, the better you’ll get. And you can go back and rewrite old stories. But nothing is better than putting in time at the keyboard. Are you working on any more books? If so, can you tell about them? I’m working on Captives, which is the first in a dystopian trilogy coming out from Zonderkidz next February. It’s based on Daniel 1, when Jerusalem in conquered by Babylon and the young people are taken into the city. Do you have a website or blog where readers can find out more about you and your work? A research journey to the setting of your novel adds authenticity nothing else can match. If someone shares your adventure, however, the fellow explorer should understand she/he is traveling with a writer, not a normal person. Consider inviting one of two kinds of people: the parenting type, who will ensure you wear a sweater and will bail you out of jail; or someone as certifiable as you. A spouse may fit both profiles. He will lend you his jacket to prevent sniffles because he doesn’t want to pay for medical visits and prescriptions. As for insanity—he married you, didn’t he? However, spouses cherish the odd notion that trips should be fun for them, too. A morning spent at the local Chamber of Commerce may not rate at the top of their bucket lists. Stop her car in the middle of the highway so you can leap out and examine someone’s lawn gnome, the perfect one to conceal cocaine in your next mystery. Serve as your getaway driver when the lawn gnome’s owner comes raging out with a shotgun. Assure you that every literary brain needs three dips of mint chocolate chip to function at maximum creativity. Fish you out of the river when, attempting to take pictures of the spot for your characters’ first kiss, you take an unplanned dive. Discuss with you over dinner the best ways to kill off your novel’s rich old lady. When the restaurant server, having overheard your plans, decides to play hero and capture a potential murderer, who else will use her taekwondo to subdue him? Only a writer friend will agree that afternoon naps sharpen senses for better evaluation of the setting. Tell you that, of course, you don’t snore (while yawning). Affirm that buying attire, jewelry, and shoes for your heroine in local boutiques will strengthen her impact in your novel. Will help you stalk the pizza delivery guy who looks exactly like your hero. Convince the hotel manager that she’s your keeper and you’re basically harmless—except when hungry. Will brainstorm with you without questioning whether you have a brain. Finally, a five-star writer-companion prays for you and your book—no matter what you’ve put her through that day. I want to take this opportunity to throw cyber roses to my novella partners, Becky Melby, Cynthia Ruchti, and Eileen Key, who performed most of the above functions when we joined forces in Wisconsin to write A Door County Christmas (2010), and our just-released collection, Cedar Creek Seasons. How about you? Has anybody accompanied you on a research trip and lived to tell about it? Hanging on a telephone wire. Okay, I really don’t know what that little ditty means and when I turned to the Internet to figure it out, it wasn't much help. But we’ve all heard it, most likely even said it, at some point in our life. I don't make lying a practice in my life (and I hope you don't either) but let's face it, we sometimes need our characters to be able to tell a believable tall tale. I recently heard about a book written by Janine Driver (with Mariska Van Aalst) called You Can't Lie to Me. Driver, a” lie detection expert for the FBI, CIA, and ATF,” helps readers recognize when people are telling the truth and when those around you aren’t delivering it straight up. I haven’t read the book, but I think I may check it out. It sounds interesting first because I’m a parent and I think it would come in handy. I also think it could benefit my writing by making my characters more authentic. As writers, we are always playing with characters, developing them, tweaking them, making them unique and memorable. I am a fairly new writer and I have some ideas of unusual or creative places to go to help flesh out characters, but I wonder what you do? What books, magazines, television shows, websites, or other sources do you use to make characters with believable ticks, habits, and mannerisms? As I, Millie Samuelson, resume my author-life following several months off to move, resettle and travel, I was tremendously inspired by an author friend's recent blog. After I finished reading it, I immediately bought the book she mentioned. Plus I started a new list of writing and publishing goals for the remainder of this year. My next action was to ask my friend if I could share her blog with you today. Obviously, she said "yes" because here it is. One favor please, zip over to her site and "meet" her before you read her blog below. And after you've read it, I'm guessing you'll do what I did (unless you already have the book she refers to): you'll quickly purchase Write His Answer by Marlene Bagnull. A couple of weeks ago I rediscovered a book as I cleaned house. It was the Bible study, Write His Answer by Marlene Bagnull. As I am looking through this book, it is so heavily highlighted in pink, I have to laugh. I was so excited about what I read years ago that I seemed to highlight every word, and now that I reread them, I know why I couldn’t put my pen down. Listen to this: “. . . we need to envision the writer we hope to become and the work we hope to produce for the Lord’s glory.” And, “When my mind is centered on Christ and I choose to rely on ‘his mighty power,’ I discover he 'is able to do far more than my highest prayers, desires, thoughts, or hopes’" (Eph. 3:20). This is found in the chapter, Making It Happen. Marlene also talks about setting goals. We can set long-range goals and then break that down into more specific short-term goals. I can’t tell you how many times I have written down goals and have accomplished some, but not all and have become discouraged. But, then I come back again, a few months down the road and start again and try to set new goals. I have since tried to not set as many goals and work though them, and it gives me more confidence to move on. This summer has been an exhausting summer for me physically and mentally. I am so glad I came across this book so I can be encouraged and remember how excited I was when I read the book for the first time. I feel the excitement building a little again. Question: Does setting goals help you accomplish more things? Please share your insights with the rest of us in a comment. THANKS HEAPS, Tammie, for your inspiring blog and for sharing it with us here! Something else inspiring from you is the book you and Joyce Ellis compiled and edited, Writing So Heaven Will Be Different. Thanks for it, too! It's one of my favorite writing books. Again, Jody Hedlund has crafted one of the best books I’ve read all year–probably ever since I finished reading her second book, The Doctor’s Lady (last November). There are books that I can tell are books... and then there are books that simply draw me in so far that I’m right there inside the characters. And I don’t want to leave. There are books that take me long days and even weeks to finish because I know I am reading a book... and that I keep having to read the book to see what happens in the end. And then there are books that I devour in a matter days that so envelop me into another world that I can hardly think of anything but opening the pages and finding out more. Unending Devotion was THIS kind of book. And those two days of devouring Jody Hedlund’s words were not enough. I dreaded getting to the end, though it was all I could focus upon. I know from attending a small writer’s conference last November, in which Jody Hedlund was the keynote speaker, that this book wasn’t exactly based on the life of one particular strong and courageous young woman’s true story as her two previous novels had been. However in the Author’s Notes at the back of the book she does explain that many of the situations and a number of the characters were part of the real history of the lumber era in Michigan. Pure enjoyment. Superbly written characters and chapters. There is nothing more I can say to exemplify how pleased I was all the way through and all the way to the very last word of this book. I was already hooked on Jody Hedlund’s writing and story-forming skills after reading her first two books–but now? In the matter of just a few books she’s come to a place in my heart really only one other author has made it to, and that is Julie Lessman. And anyone who really knows me knows that I am completely and utterly in love with Julie Lessman’s books, characters and writing skills. Now I guess I’ll be applauding Jody Hedlund just as much. But wow. Jody deserves it. I was given a paperback copy of this book by Bethany House in order to read and give my honest review for a LitFuse Publicity Blog Tour. I give her third book, Unending Devotion, 5 stars. Find out more about Jody at jodyhedlund.com. Don’t miss a moment of the RSVP today. Tell your friends via FACEBOOK or TWITTER and increase your chances of winning. Hope to see you on September 18th! 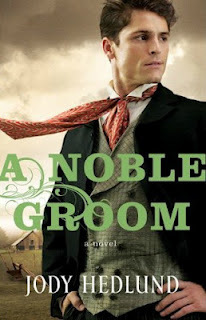 Jody Hedlund’s Fourth Book, A Noble Groom, Comes Out Next April! I've been to many large writing conferences and have worked freelance for agents and editors, but I still remember my first meal time at an editor's table. I thought I'd forgotten everything my mama taught me about eating with "important" people. Is this napkin for me or the person beside me? What if I panic and can't remember my pen name?? At the ACFW conference during lunch and dinner, you will be given the option of sitting at a table with an agent or editor of your choice.Yes, you will probably give a short blurb about what you write (wait for it--they'll ask.) Yes, it will be noisy,and there will be others at your table who also are interested in the host of the table. The agent or editor may be distracted by any number of things. There will be announcements and wonderful things going on. 3. Have your business cards available without fumbling for them for others at your table. (You can put them in your name tag.) You'll also want to chat with those at your table because these people can become your good friends. (And really, you just never know how they will be bridges for you.) Ask the person beside you about her writing. Chances are, you'll relax while listening to her. 5. Have your 30 second pitch ready (they will probably ask you) and do not hog the table talk time with the agent/editor. Answer questions, but do speak with others at your table, too. Sometimes it is difficult to hear if you are across the table, too, so be aware and be willing to help others at your table communicate. Think of always being gracious. 6. It may be sooo important to contact that editor/agent because you've spent so much money for this conference, but I've seen rudeness occur when people will "save" chairs at a table, and even rushing to take the chair ahead of someone else. This isn’t junior high. Be polite and trust that there will be God-incidences happening. Some editors and agents have noticed if you're chair-grabbing and they have good memories. 8. No matter how friendly you have become with an agent or editor, be courteous and respect her/him. I saw a whole table "tease" an editor about something this editor "seemed" to be comfortable about, but behind the scenes this editor went back to the room to fume/be hurt--and let organizers know about it. Be sensitive. Don't tease or talk about volatile/sensitive issues. Try to put yourself in that person's shoes. 10. Do be aware that the conference is jam-packed and an overload for everyone. Presenters, editors, agents, authors may need a minute to collect thoughts or just need nourishment. Give the host a chance to sit down (do save a chair for the host!) eat a little and maybe even sample the dessert. Each one has an individual personality and will try to lead the table. He may want to know what you've been reading, what book impacted you this year, or even ask you what you think about green tea. I have found that the ACFW conference has the nicest, most helpful people. My special times were when someone stopped me from being a deer in the headlights as she quickly prayed for me on the way to her own appointments or encouraged me to come sit with her at lunch. Don't sit in your room and order room service--get out and be with others who are just as passionate as you are. When you go into the "cafeteria," even if you are the new kid in school, you'll find a place and it will be the right place, the right time. For those who have been to conference, do you have tips to add for first timers? What's your most memorable table talk at a conference? More Self-Editing Tips: It’s or Its?